Vitamin C (ascorbic acid) in polarized light. Place the slide on a warm, but not hot plate or rest the slide for several hours (or over night) for the water to evaporate. It is possible to follow the formation of the crystals. Problem: As the water evaporates, it starts to retract and does not form a nice thin layer of crystals on the slide. The crystals are thick and dense. Solution: This is due to the surface tension of the water. Carefully spread the water all the way to the corners of the slide. The water should actually contact all the corners. The water is then not capable of retracting as it evaporates. The addition of surface tension reducing substnces (such as soap) may impair the crystalization process. Dissolve A knife-tip of the substance in a few milliliters of pure alcohol. Shake until all of the substance is dissolved. Place the slide horizontally on a table and wait until the alcohol has evaporated. This should only take a few minutes. 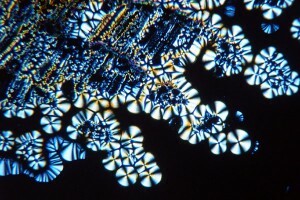 Crystal formation can be observed. Careful: do not ingest! Only use very small amounts. 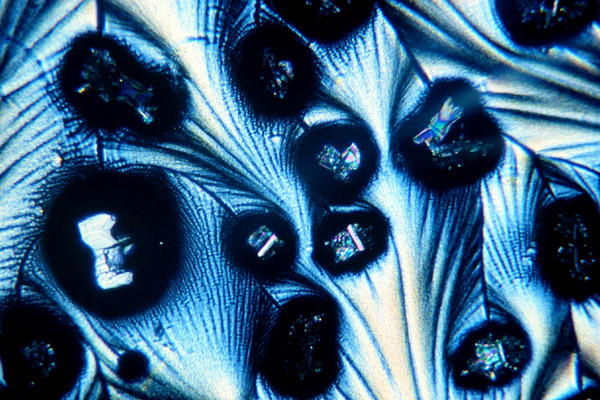 Place a few grains of crystal on a microscopic slide and put a cover slip on top. Carefully place the slide on a hot plate. The crystal will melt and will spread between the slide and the cover-slip. Do not overheat. The substance should not start to smoke or change its color. Remove the slide and rest over night. Crystal formation can take several hours. Alternatively, the melt can be spread out over the slide without a cover slip. Crystal formation can then be easily initiated by carefully touching the (cold) melt. Dust, crystal parts still sticking on the the fingers will initiate the crystalization. 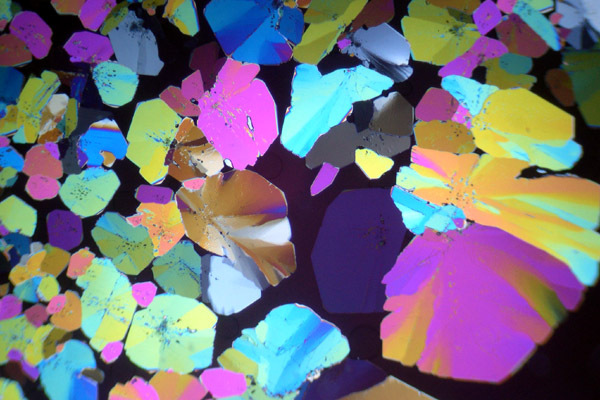 Crystals of organic substances make interesting microscopic specimens to be viewed under polarized light. This is citric acid (citrate) viewed using polarizing filters. Solution: This is quite possible, but not the rule. If both slide and cover slip are too clean, then there is not place for crystal formation to start. Use more citric acid the next time, so that some of the substance flows out beneath the cover slip. This can then be a place to initiate crystal formation by carefully scratching the substance with a sharp object. It could also be that the citric acid was overheated. Solution: Bubbles are difficult to avoid completely, and in many cases they make the specimen more interesting (and beautiful) to observe. It is possible to melt the crystals first, and then press the cover slip on top of the melt. This also reduces the bubbles.